Our game, From Sea to Shining Sea, is set in the heat of the Cold War, October 1962, during the Cuban Missile Crisis. We chose this time because it was the closet the world has ever came to nuclear war. Thankfully the U.S. and the USSR were able to come to terms and successfully avoided a major catastrophe, the question still remains, how would the world look if nuclear war was waged? This is exactly the question that From Sea to Shining Sea poses and using an engaging story line the player is allowed to see the consequences of nuclear warfare. While depicting this awful counterfactual our game also makes comments on Cold War aspects such as McCarthyism, gender roles, and the dangers of an over powered government. This creates a gaming experience that is interesting but also correctly depicts different aspects of the Cold War. Brenna Rodgers- Brenna has spent a ton of her family time playing video games. She likes to play competitive games like Mario Kart but she also likes playing games like Skyrim and the Legend of Zelda series. In addition, she enjoys games that are heavily story based. Brenna focuses on the creation of the game as well as the introduction and conclusion of the portfolio. Cole Frazier- Cole enjoys playing sports games like the Madden and NBA 2k series, but he is also a real MLG because he loves the Fallout series. 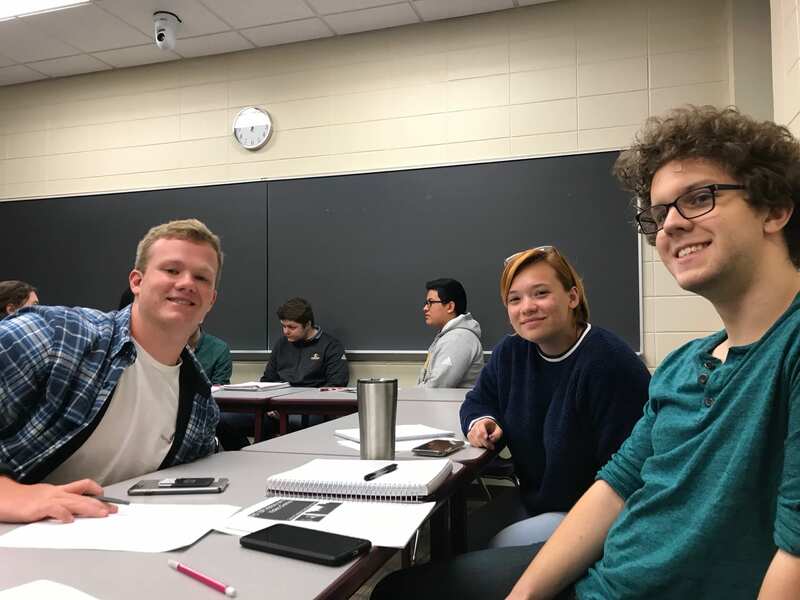 Cole focused on historical research for the most part, studying sources on McCarthyism, the Cuban Missile Crisis, and American heads of state during the Cold War. Luke Duncan- Luke is from the small town of Danville, KY where he grew up playing sports and video games with friends. His favorite game memories include quick scoping noobs on MW2, Black Ops Zombies, and raging after losing a game of NCAA football. Luke focuses on the historical research and challenges in the game. Luke Hussung- Luke is from Knoxville, TN and grew up playing Nintendo games with his family. He spent many hours of his childhood playing a Night Elf Druid on World of Warcraft. Luke worked mainly on the creation of the game in Twine and on the games referenced paper. Nick Alicea- Nick enjoys playing Call of Duty and solo games like Skyrim or the new Spiderman game. Nick worked on the historical research and on the essays in the portfolio. Fog of War, directed by Errol Morris (2003; United States: Sony Picture Classics, 2003), DVD. From Sea to Shining Sea Squad had a an awesome time researching, creating and playing the whole term. Everyone in our group would agree that this Centre Term was one that we will look back on and cherish because not only did we get to participate in one of our favorite hobbies, we got a taste of what goes into creating the games that we enjoy. We will never look at video games the same after this term because now we are aware of the story telling, history recapping and thought provoking potential that exists in games. 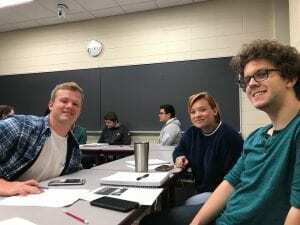 Not only are video games a medium in which history and many other topics can be discussed, they are also an art form if done with care, and it has been a pleasure to create our video game this semester. Tom Standage’s book, A History of the World in 6 Glasses, is one of my favorites because it provides a broad history lesson of human kind through a unique lens, solely looking at how different periods of time can be categorized by the most popular drink. Other books like Mark Kurlansky’s Salt and Cod are good examples of this too, they argue that history can be examined in ways contrary to popular models such as the, “Men of History,” model or the progressivism model. They argue that history can be examined through economic and cultural shifts, like where was salt or cod being bought and sold, or where was tea being made and transported? In the same way, if you were to look at the Cold War you could illustrate history through the lens of popular music. The Cold War was a time standing from roughly 1945 to 1990, which also encompasses the golden age of Rock ‘n Roll music. By looking at the status and evolution of Rock ‘n Roll a person can get a feel for how American culture changed through time during the Cold War. Rock ‘n Roll traces its origins back to the 1920s and ’30s. During this time the genre of music called the blues was emerging and jazz was already prominent. Musicians like Robert Johnson, Muddy Waters, Blind Lemon Johnson, and Lead Belly were showcasing the earliest and rawest version of the blues that would later transfuse with guitar styles shown by popular jazz guitarists like Django Reinhardt and West Montgomery to later give birth to the classic rock age of the ’60s and ’70s. But before this happened there were many more musicians that incorporated blues forms with jazz techniques. The three, “Kings of the Blues,” were B.B., Albert, and Freddie. They all were terrific blues guitarists that utilized the simplicity of long drawn out notes and relied heavily on their masculine and scratchy voices to portray their “blue” emotions. But, along side them was always a “big band” a huge arrangement of horns, drums, and a piano that was not seen before in early blues music. This transition of the solo blues guitarist into the blues singer with a huge band behind him coincided with the popularity of the genre. The blues was emerging from its delta origins and spreading to big cities, most notably New York, Chicago, Los Angeles, and Dallas, where each would develop different tastes. The popularity of the blues also led to the expansion of audience. The blues was developed by African American culture in the south and the spread of the genre to northern cities led an increase of African American popular figures. This led to many artists like Bo Diddley, Etta James, and Fats Domino’s success. Along side the rise in African American popular musicians, many white Americans began to emulate the styles that emerged from the blues. Most notably Elvis Presley, his songs, “Hound Dog,” and “That’s Alright,” were actually covers of past blues musicians “Big Mama” Thorton and Arthur Crudup. This adoption of the blues into the main stream played a huge role in the civil rights movement of the ’50s and ’60s. As more African American musicians had bigger and bigger audiences, their message could reach more people. Songs like B.B. King’s “Chains and Things,” and Lead Belly’s, “Bourgeois Blues,” spoke of the racism that was present in America before and during the civil rights movement. Diving into the ’60s, the blues were taking on a new form, a closer form of what we know to be Rock ‘n Roll. Musicians like Eric Clapton, Jimi Hendrix, and Carlos Santana were all putting their twists on the blues form, adding Latin styles, new technologies, and psychedelics into the mix. During this time music began targeting the “big man” that was government. Songs like “If 6 was 9” by Hendrix, “I’d Love to Change the World,” by Ten Years After, and “For What It’s Worth,” by Buffalo Springfield, were all directed towards the U.S. government as a means of protest to, “white-collar conservatives,” and Hendrix put it. These songs established a firm distrust in the government by people and led to huge misconceptions by both sides. The anti-war protestors were cast out to be communist druggies who detested the U.S.A., and the government and soldiers that were trying to stop the spread of communism into south east Asia were characterized as murderous war lords. Songs like “Machine Gun,” “American Woman,” and, “7′ O’clock News” were heavily geared towards withdrawal from Vietnam. Bob Dylan was a huge anti-war protestor during this time with, “Blowin’ in the Wind,” he also calls out politicians during this time essentially telling them their methods were outdated in his song, “The Times They are a Changin.” It’s also crucial to point out John Lennon, who’s “Imagine,” will forever be a song dedicated to his message of peace, but many people also see it as a song that supported anti-American ideas. During this time the women’s movement was also in full swing. Many women found a voice through song and took to lyrics as a means of feminism. One of the best blues singers of all time, Aretha Franklin, wrote, “Do Right Woman, Do Right Man,” illustrating the gender inequalities of the time. Also, Leslie Gore’s, “You Don’t Own Me,” was widely popular and emphasized the goals of the women’s movement. There were plenty songs against the idea of nuclear war as well. While playing the Fallout 4, if a person tunes into Diamond City Radio, they will hear a whole plethora of songs themed around nuclear war. This was the case for most of the Cold War, people’s fear of atomic war bled into their music with songs like, “Enola Gay,” and Everybody Wants to Rule the World.” This use of songs to display fear of nuclear war would be an interesting detail in our game since ours is based around nuclear fallout, however it may be difficult to do so with Twine. However, it is interesting to see how music has evolved with the different movements of American culture. Musicians took to song to get their message across about various topics in the 20th century, topics like war, racism, and gender equality. It should be noted that the use of music as a means of protest is not solely a 20th century American occurrence, all throughout history and the world people have been using music as a means to protest. However, I believe that the period of the Cold War gets much more attention because it is fantasized today as a message of peace and an example of the power of the people. Video games come in many genres. There RPGs such as the Fallout series, MMOs like World of Warcraft, and FPSs like the Call of Duty series. There are so many different genres and games already available to players, many gaming companies are now having struggles trying to differentiate new games from the old and give players new experiences. This scenario is what primarily led to the massive success of the Battle Royale genre and more specifically, the popularity of the game Fortnite. The Battle Royale game genre is characterized of a large server of participants being dumped onto a large map with essentially no weapons to start with. It is up to the player to adapt to their environment quickly and collect weapons, ammunition, and supplies that will help them win the match. In the Battle Royale genre a match is usually only worth one life, in other words there is no respawning. You may play alone and seek to be the last man standing, or you can play with a team usually up to 3-5 teammates. The objective of the game is for you or your team to eliminate enough enemies from the match in order to be the last player alive. This genre seems on the whole not very innovative when compared to games like Call of Duty, especially when you examine the game modes “Free-for-all” or “Gun Game.” However, what does separate the Battle Royale genre from these game modes is the tension the player feels from not having the respawn option. The feeling of having only one life creates a more urgent vibe when playing the Battle Royale genre. But how did this genre come about? Mike Wehner of Yahoo! makes the case that the Battle Royale genre was first popularized by mods created in Minecraft servers that intended to replicate the experience of the competitors in the movie The Hunger Games. He argues that the popularity of both Minecraft and the popularity of The Hunger Games that created a want for more Battle Royale type games. This want sparked the games of Fortnite, PUBG, and Playerunknown’s Battlegrounds. These were all instant successes, with Fortnite leading the pack. Fortnite is interesting to the gaming community, mainly because it rides the ever increasing tide of “Free-to-Play” Games. These free to play games are becoming more popular because they are an effective way for gaming industries to essentially get gamers hooked onto their product. In the case of Fortnite players do not need to pay in order to get any type of competitive advantage, players can only buy skins and different emotes. But, many other games enlist a “pay to win” or “freemium” strategy. Pay to win games are extremely criticized by the gaming community for obvious reasons. A vote cast on Reddit elects APB: Reloaded as the worst case scenario of these pay to win games, citing the gameplay as unfair and unrealistically difficult. However, by purchasing advantages outside of the original game purchase, the game becomes much easier. This enrages the gaming community because essentially brings the original price of the game up to an astounding total. However the new gaming idea of loot boxes is arguably what is most annoying to the modern gamer. Loot boxes are like little gambling machines in which you spend your video game currency (or real world money) on a mystery box that will give you random stuff that is in the game. At first this doesn’t seem all too deceptive because all you have to do is keep spending in game currency until you get the object or objects that you are wanting to acquire. The problem arises when you keep grinding long hours into the game for currency to open boxes that in the end will only have a slim chance of actually giving you what you’ve been wanting to unlock. It feels like the gaming company wants you to eventually give up the hours of grinding and instead buy the loot boxes with your real world money. Even when you trade your money for the time you will save, you still have to hope and pray that those loot boxes you just spent real money on will have what you are looking for. These examples of money grasping schemes are largely absent from Battle Royale games however, which is another component as to why they have become so popular. Although they do not offer much to the avid gamer that lives for the immersive gameplay of RPGs, they do provide a fun and full experience to the casual gamer. Today during the initial brainstorming period, our group discussed a wide variety of ideas and concepts that our game could incorporate. We discussed the different time periods and settings we were all interested in, and we came to the conclusion that our game would be centered around a 20th century war. We discussed World War Two, the Vietnam War, and the Cold War as different possibilities. We contemplated the idea of basing our game off of the movie Red Dawn, begging the question, “What would have happened if the Soviet Union had invaded the U.S.?” Also, seeing as I and Luke H. both had Professor Harney’s History 110 class last semester, we talked about basing the game off of Heart of Darkness, by Joseph Conrad, and the movie Apocalypse Now. Using the Vietnam War as a setting and having the game based around the objective of finding a missing person lost in the jungle could be entertaining and suspenseful while also shedding light on the history of the conflict. Lastly we talked about WWII and again begged the question, “What if?” Perhaps the U.S. did not intervene in WWII and Nazi Germany and Japan became major world powers. What would become of this scenario? While we are still brainstorming ideas for the setting and plot of the game, we have decided to use Twine as our software. We all agreed that Twine would be the best choice for our game because we all liked the “Text Only” feel and the emphasis it would put on decision making throughout the game. We discussed the Tell-Tale games of The Walking Dead and The Wolf Among Us, two of my favorite games, and we wanted to have that sort of vibe in our game, where the game was almost solely driven by choice and would have different endings based on the player’s decisions. So, to wrap things up, Luke D., Luke H., Brenna and I, the Sea From Shining Sea Squad, are going to use Twine as our software because we want emphasize decision making and have a straight forward, almost ominous vibe. We will focus on some 20th century conflict and “counter-factually” thwart history to make the game interesting, but also include many insightful details throughout the game that will grant the player some knowledge as to what life in the past truly was for many people.